Derailed is a good name for tonight’s beer. Beer #261 by Erie Brewing Company from Erie, Pennsylvania is Derailed Black Cherry Ale. This Cream Ale has an ABV of 5%. I’m a train buff so I liked the label on here as it depicts an Erie Railroad train engined…derailed. It poured a cloudy muted orange color with no head whatsoever. The nose was very faint. I could pick out the cherry…barely. There was also a touch of grins in the aroma. The sweet cherries opened the taste with a taste kind of similar to a black cherry soda…but not quite. There was something off with the cherry flavor…it was almost too fake tasting or forced. Towards the middle of the mouthful, a cereal (think something like Cheerios) took over and then the tartness of the cherries picked up the towards the back end of the sip. It had a fake cherry aftertaste which i didn’t really enjoy. The body was light, it was crisp, and had some decent carbonation. Ehh…another below average beer for me. It was just too…artificial…that is the word I was looking for, in the cherry department. There was nothing here that made me want another. Like I said, Derailed it was as this was way off the track of being a decent beer. Into the pint glass went this hazy pale yellow brew. The head was quite large at first but it didn’t last. There were some very light malt, grain-like, and corn aromas wafting up to my nose. The taste mirrored the nose but there was a bit of lemon I picked up also. It had a bit of an odd aftertaste that kind of lingered. It had a very light consistency to it with quite a bit of carbonation and was very crisp. Before I knew it the glass was gone. It was very easy to drink. I could see myself drinking this with a nice pizza, the good stuff, not the Chicago or California style, but good old NY/NJ pizza or as I like to say…real pizza. 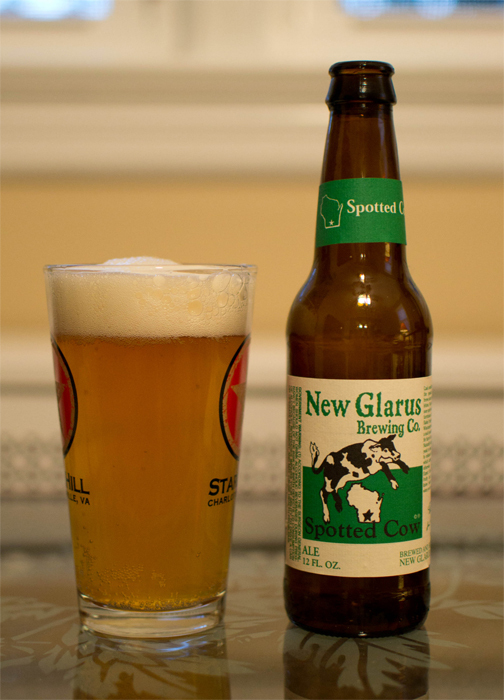 I thought the Spotted Cow was decent. It wasn’t the worst beer I have had but fairly middle of the road.